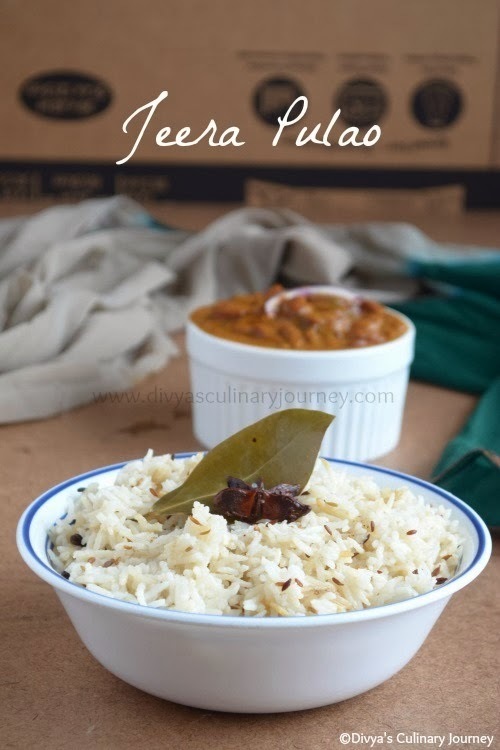 Jeera Pulao is a simple cumin flavored rice. It is very quick and easy to make and it tastes best with most of the spicy gravies. I served it with Rajma masala (will post the recipe of Rajma masala soon) you can serve with other gravies of your choice too. Wash basmati rice and soak it in water for about 15 minutes then drain the water and set aside. In a pressure cooker, heat oil and ghee then add cumin seeds, bay leaves, Star anise, cloves, cinnamon and fry for a minute or two. Now add the soaked rice and required water, add salt mix well and then cover the lid and pressure cook it till rice is done. Then turn off the heat, let the pressure release. Gently fluff up the rice and serve with gravy of your choice. You can add onions and green chillies for extra flavor( in the step 2 saute and then continue to cook). When using pressure cooker for one cup of basmati rice I use 1 1/2 cup of water while using electric cooket the ratio will be for one cup of basmati rice I will add 2 cups of water. If using electric cooker, Follow step 2 in a skillet. Transfer the ingredients to the rice cooker, add required water, close and cook. genlty fluff the rice and serve. Jeera rice looks delicious. Easy to make and healthy. Good flavoured, delicious rice dear ! ! ! 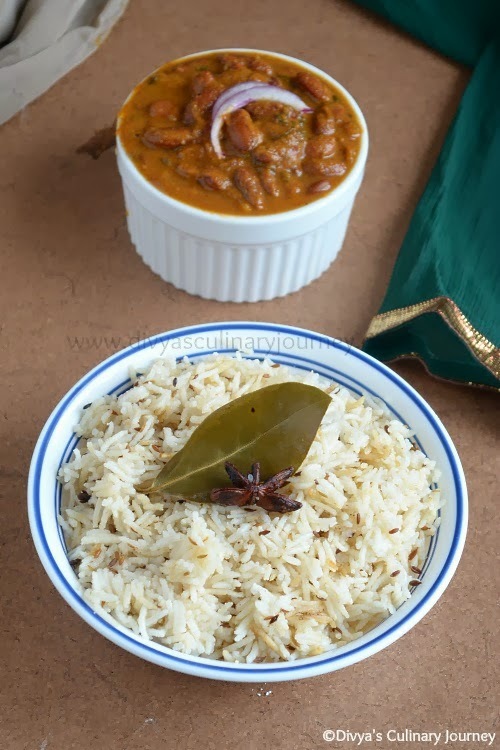 Simple delicious rice that goes well with many veg gravies..
wow...jeera rice n the rajma masala makes me drool :) love jeera rice anytime! 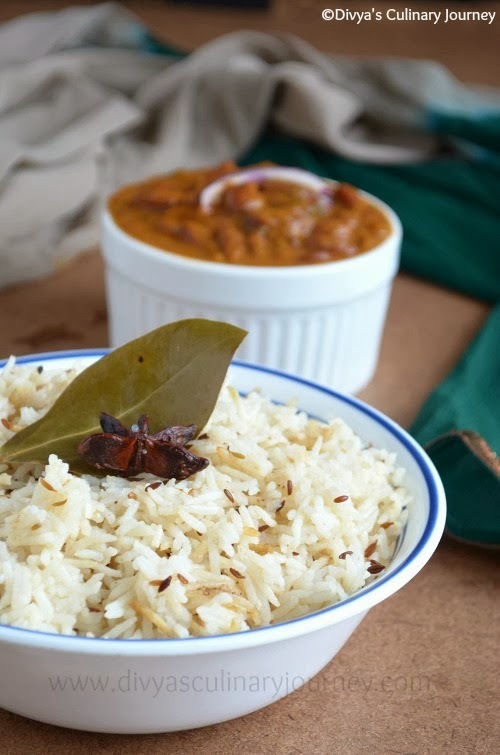 Wow jeera pulao looks super inviting dear :) make me hungry here such an Delicious combo pulao with beans curry :) Wud love to invite myself to you home dear !! Jeera rice looks really good. Never get bored of this fantastic one pot meal..my all time favourite. perfect with that bowl of beans.